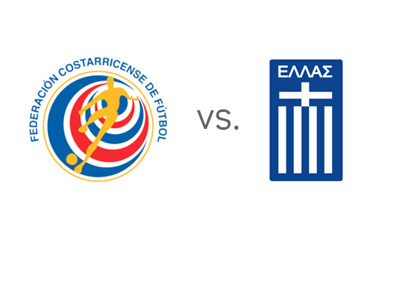 Costa Rica and Greece meet in the FIFA World Cup Round of 16 on Sunday, June 29th, 2014 at Arena Pernambuco in Recife. Costa Rica are arguably the most pleasant surprise of the 2014 World Cup thus far. They topped the 'Group of Death' ahead of Uruguay Italy and England, with two wins and one draw. The twenty two year old Arsenal forward (on loan at Olympiacos), Joel Campbell, is looking very good for Costa Rica and so does the team's goalkeeper, Keylor Navas, who plays his football in Spain at Levante. After losing their first match to Colombia with the score of 3-0, Greece drew 0-0 with Japan and finally booked in a victory vs. Ivory Coast by converting a last minute penalty, which saw them qualify to the round of 16. Greece are famous for their defensive approach to the game, but they have proved that they can counter-attack as well. Georgios Samaras, who plays for Celtic FC, is the team's best known player. Costa Rica are the favorites to win the match according to the odds. Although both teams are regarded as outsiders in the competition, either Greece or Costa Rica will find themselves in the quarter-finals of the World Cup, potentially only two games away from the big final in Rio. Will it be the attacking Costa Rica or the defensive minded Greece advancing to the next round? The kickoff is at 1pm local time. The winner will play the winner of Netherlands vs. Mexico on Saturday, July 5th, 2014.